There is much debate between two of the most widely used stones in the home building and remodeling industry; marble and granite. Everyone wants to know which is better? The page that follows will allow you to discover the pros and cons of both and make this decision for yourself. Many people want to know if marble or granite is better for countertops in their kitchens and bathrooms. After all, both are beautiful materials, both provide undeniable beauty and elegance to any home. Both are also available in many varieties to suit your tastes and the decor of your home. On the other hand, there are a few differences between these two stones that you should seriously consider before choosing between them. Rather than making this decision for you, why not let the facts speak for themselves. First of all, marble is a metamorphic rock. Marble's basic ingredient can be found everywhere from limestone to baking soda, from calcium carbonate to lime. The basic ingredient goes by many other names depending on its application and its form. Limestone, a sedimentary form of calcium that is found naturally in the earth, undergoes intense heat and pressure within the earth to be formed into what we know as marble. This rock can also be exposed to heat and grinding to become a filler ingredient for medications, writing paper, plaster of paris, lime (white wash), and cement hardener. This means that marble, although beautiful and durable, is porous and very easily destroyed by any type of acid, heat, or water. Even with a seal coating applied religiously every year, no types of chemicals may be used to wash the countertops made from it. It cannot take much abuse from water, acids such as lemon or orange juice, or high heat from pans. These will all destroy the seal coating and the marble beneath. Since marble is so porous, it is also easily stained. One single scratch can allow liquids or even oxidation from the air to leak under the seal coating and stain the marble. This doesn’t mean that it should not be used. Marble is ideal for use in low traffic areas or for sculpting amazing art out of. But for the high traffic use of a kitchen countertop, a floor, or a bathroom countertop, marble just means high maintenance. Granite is also a metamorphic rock. It is a composite of quartz, silicon, feldspar, mica, and several other minerals. It too is formed under high pressure and heat. It is also just as beautiful. It is not as porous as marble and is resistant to chemicals and acids. The presence of quartz in granite provides the granite with a durability and hardness unlike that of soft marble. Granite is more stain resistant and wear resistant than marble. 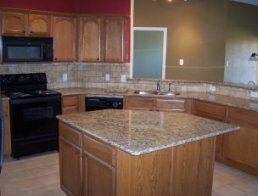 While it is not perfect, granite holds up far better in high traffic uses such as counter tops and flooring. With a proper seal coating on granite and with proper care, granite will last for many years without scratching, staining, chipping, or wearing away. If properly cared for, granite may not need to be resealed every year. 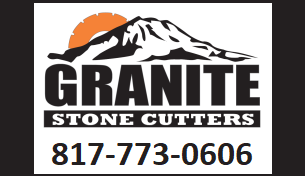 Granite can also be quarried locally. This means that, unlike marble, granite will not have to be shipped from South America or Europe. Granite can be quarried in Arizona, New Mexico, and some northern states. Granite is also easier to ship. Even if the granite you select comes from South Africa, China, Asia, or Europe, there is more granite available. This means it's easier to obtain and less expensive to use. Ultimately It's Up To You! Whether you choose granite or marble is up to you. 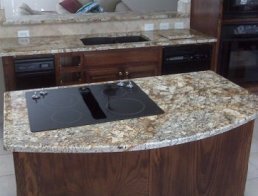 When asked which one is better for the high traffic use of countertops, the answer should be clear, granite will simply hold up better. When properly cared for under normal conditions, granite is easier to care for and is resistant to staining, chemicals, heat, and fracturing. Granite is available in more colors and patterns and can be custom ordered for less than marble.